Twycross Zoo is renowned for the big apes it houses. My two favourites are the Orang-Utans and the Gorillas. 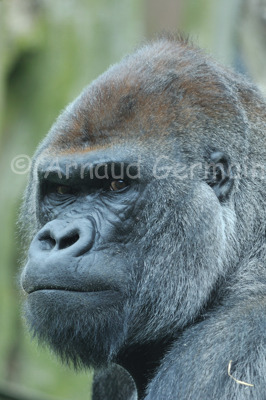 The male gorilla oozes strength, confidence and at the same time calm and peacefulness. I absolutely love looking at their eyes. When this big male gorilla came outside and sat relatively close to the window, I saw my chance to take a portrait of this magnificent animal.